View of Charleston in South Carolina, America. It is the oldest city in the state and was originally named Charles Town after Charles II of England. It was founded in April 1670 as the capital city of Carolina and was situated at Albemarle Point on the backs of the Ashley River, on the opposite side from its current site on the main peninsula. 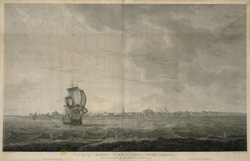 In 1690 the town was moved a few miles to the opposite bank of the river to Oyster Point. It became one of the major ports in South East America it developed into a major trading centre.